A few years ago, Howard M. Bender and a friend went out to grab some breakfast. But instead of getting pork bacon, they opted for the healthier option, ordering turkey bacon instead. But when it arrived at their table, they were disappointed: The turkey bacon was hard and dry and not like real bacon at all. And so Bender—a chef who had trained at the Culinary Institute of America—decided to come up with a better option. He spent three years formulating Schmacon, a whole-muscle, smoked and glazed beef bacon that just launched a Kickstarter campaign. 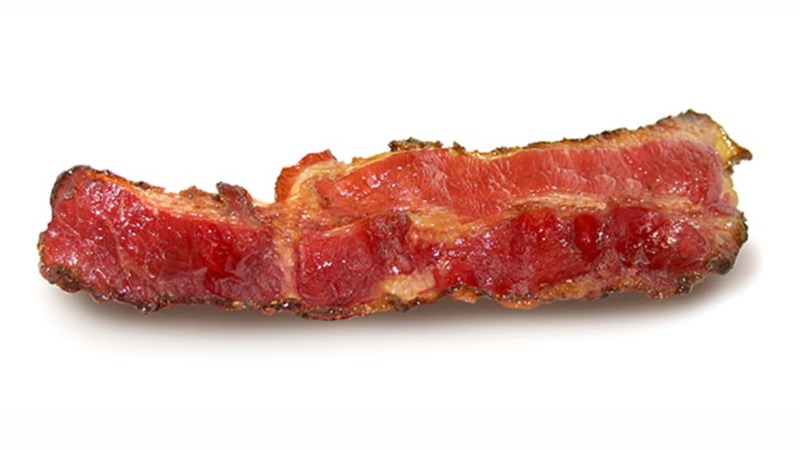 Still, Bender points out that Schmacon has some advantages over pork bacon: “It’s lower in calories, fat, and sodium than almost all of the pork bacons that are out on the market today,” he says. Schmacon is also all-natural and uncured with no nitrates. So how does the stuff actually taste when compared with regular bacon? I grabbed a package of store brand pork bacon and noticed a few differences right off the bat: It was much easier to pull off strips of pork bacon from the mass than it was to get the Schmacon free—I tore more than a few strips and even ended up cooking a few stuck together. But Schmacon’s deep red color was much more appealing than the pork bacon’s light pink. Cooking the Schmacon took less than 10 minutes, and it perfectly achieved that wavy shape. And while Schmacon doesn’t taste that much like pork bacon, it is delicious, smoky-sweet and full of flavor (so full of flavor, in fact, that it brought to mind an easy-to-eat beef jerky). I inhaled it and left all but one piece of the pork bacon in the pan. Schmacon is currently available in some restaurants, but if you’re Interested in trying it in your own home, contribute to the Kickstarter—$30 will get you a pack of Schmacon shipped directly to your door.